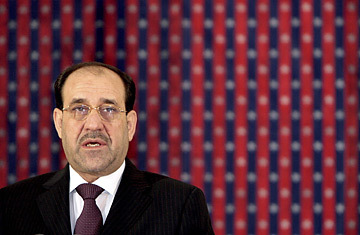 Iraq's Prime Minister Nuri Al-Maliki. Why is Iraqi Prime Minister Nouri al-Maliki still around? His cabinet seems to be crumbling around him. In April, the bloc allied with Shi'a strongman Moqtada al-Sadr pulled its ministers from Maliki's cabinet in protest of the Prime Minister's reluctance to set a timetable for U.S. withdrawal from Iraq. (The head offices in key ministries such as health, education and transportation are still empty.) Then, two weeks ago, four Sunni ministers began boycotting al-Maliki's cabinet meetings to protest an arrest warrant issued for a fellow Sunni minister. Rumors have been spreading for months that the government is on the verge of collapse. He's going to be ousted by fellow Shi'ite partisans, said one. He'll be overthrown by a CIA-led military coup, according to another. The White House has never hidden its frustration with the slow pace of change under Maliki. Indeed, e-mails shot around last fall listing a full slate of potential cabinet ministers in a fantasy government headed by former Prime Minister Ayad Allawi. But it's been over a year since he took office and Maliki hasn't budged. How has he kept hold of power in what some critics are calling a failed state? The answer: political acumen and the inability of his detractors to come up with someone among themselves to take his place. Unlike his predecessor, Ibrahim al-Jaafari, who was more of an intellectual, Maliki has turned out to be a street-smart politician. He ingratiated himself with the Kurdish bloc when he stood up to aggressive Turkish rhetoric about the Kurdish border in May. He's managed to hold onto the support of the Shi'ite coalition by gingerly two-stepping around the abolition of militias  authorizing coalition and Iraqi troops to fight them in some cities, leaving them largely untouched in others. If Maliki goes, one of these groups will have to sign on to the change in Prime Minister  and, at this point they can agree on no one else. What's more, the U.S. cannot just turn around and tell Maliki it is time to go. The Bush administration used up a lot of political currency among Iraqis when it lobbied for the replacement of Jaafari by Maliki in March 2006. Jaafari, while ineffectual, was someone whom everyone could work with. The U.S. will find it hard to pull off a similar overhaul again and still say Washington is promoting Iraqi independence, much less democracy. All this doesn't mean, of course, that Maliki's men aren't nervous. Even those closest to him are wondering if some of those rumors might be true. At a recent meeting in the Green Zone, an aide to Maliki was nervously joking with U.S. Ambassador Ryan Crocker. "I hear we're gone on September 30th," he told Crocker. But Crocker joked back with a zinger, "What's wrong with Sept. 15th?" That's the day when General David Petraeus and Crocker are slated to report to Congress on the effectiveness of the troop surge. The Administration is then expected to unveil a list of tactical shifts on Iraq. Still, given Maliki's skills  one might even say his irreplacability  even that deadline may not involve Maliki leaving office.